On April 8, 2005, two students accepted delivery of chemical supplies and placed them in storage at a university lab in Ohio State University. They packed 10 to 12 bottles of hexane in a solvent storage cabinet. The shelf collapsed. A bottle of hexane smashed and one student suffered cuts on his arm. The students immediately vacated the area due to the overpowering hexane vapors. As the students exited the room, the hexane ignited. One student described the event: "I saw [the first student] run out of the lab yelling fire. I saw flames lick out from under the door. I could hear it as each bottle started exploding." The incident resulted in approximately $200,000 of damage, destroying the lab and valuable research data. It took 84 fire fighters and 20 fire trucks to bring the fire under control. Prevent damage to property and injuries to people by using approved safety cabinets for chemical storage in laboratories. Flammable chemicals catch fire easily. It is not actually the liquid chemical that burns, but rather the vapor that builds up on the surface of the liquid. The National Fire Protection Association (NFPA) defines a flammable liquid as one that has a flash point below 100 F (38 C). This means that an ignition source will ignite the chemical below that temperature. The solvent hexane is an example of a flammable liquid used in laboratories. The Globally Harmonized System (GHS) of classification and labeling of chemicals defines its 'corrosive to metal' class as "a substance or a mixture, which by chemical action will materially damage, or even destroy, metals." Aqueous liquids with a pH of < 2 or > 12.5 are capable of destroying steel at a rate of more than ¼-inch (6.35 mm) per year at a test temperature of 131 F (55 C). Any substance with a pH value of 0 to < 7 is considered acidic. Acids with a pH below 2 are corrosive. They attack and slowly destroy metals like steel. 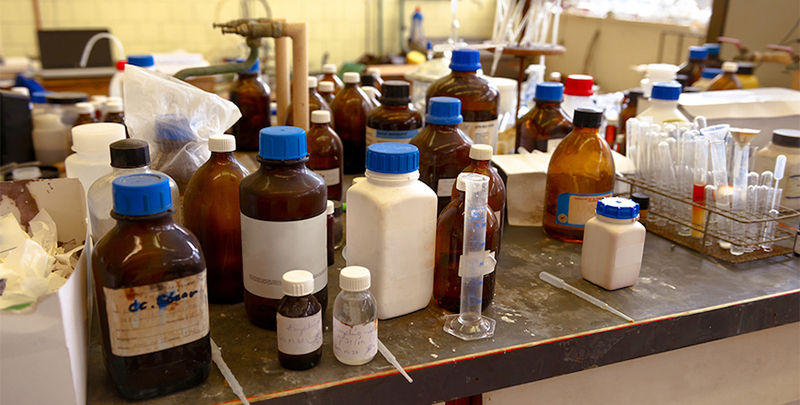 Hydrochloric acid, sulfuric and nitric acids are all corrosive acids used in laboratory tests. Bases are any substance with a pH value of > 7 to 14. Bases or alkali liquids with a pH above 12.5 have a similar corrosive effect to acids. They also attack metals and eat away the material bit by bit. Calcium hydroxide is a common corrosive base. Vapors emitted from lab chemicals are most often the source of fire and corrosion. They ignite in the case of flammable liquids. The vapors from corrosive chemicals cause damage by condensing on metal surfaces. For safe corrosive chemical storage, always seal the caps of all containers tightly to prevent the release of vapors. Maintain low humidity within the laboratory environment to mitigate condensation. The ChemCor® double-wall steel safety cabinets feature enhanced protection against corrosion from drips and off-gassing of harsh chemicals. A flame-coated thermoplastic liner on all interior walls, ceiling, sump, inside doors and shelves help prevent cabinet surfaces from rust and corrosion. The seam-free, non-porous surface resists staining and eliminates the need for rivets or other metal fasteners. The high-density polyethylene (HDPE) construction of these safety cabinets suits the storage of strong acids and bases. They store chemicals like hydrochloric, sulfuric and nitric acids as well as sodium, potassium and calcium hydroxide. Polyethylene safety cabinets have no metal parts. Recessed channels in the shelves and base direct spills into a leak-proof sump. Three application-specific labels identify contents to segregate incompatible ACIDS, BASES and CORROSIVES for safe chemical storage. The long-lasting construction of wood laminate chemical storage cabinets provide exceptional strength as well as stainless steel handles and hinges to resist corrosion. They are ideal for highly corrosive chemical liquid storage. Laboratory safety begins with a hazardous materials management program. This ensures you cover all the bases for safe chemical storage and handling. Check the Safety Data Sheet (SDS) for each chemical to identify its hazards and compatibility with other chemicals. Choose the right chemical storage solution to prevent flammable accidents from occurring in your lab. 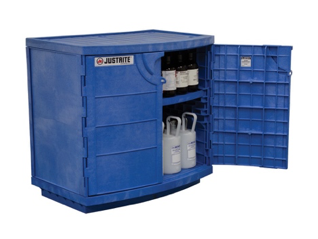 Justrite supplies a wide variety of chemical storage safety cabinets designed for the laboratory environment, including space-saving countertop, piggyback and undercounter models. 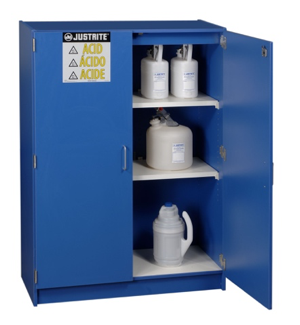 All Justrite safety cabinets come with a ten-year warranty.